Oreo sent me their new Oreo Flavors a week or two before they hit the shelves. One of these new flavors is their Marshmallow Crispy Oreos. Oh my gosh. DELISH! Seriously, if you haven’t tried this new flavor yet, I highly recommend doing so. After sampling it, I knew I wanted to create my own Rice Krispie Treat Frosting…. The end result was amazing! After making it, I googled it to see if it had been done before and noticed my friend Julianne from Beyond Frosting made her own version as well! I love to give blogger love wherever I can and even though I didn’t get the recipe from her, I want to give her a shout out as well :) Ours our also different. I incorporate some marshmallow creme in mine to add to that yummy marshmallow flavor as well as a few other slight changes. Takes Rice Krispie Treats to a whole different level! 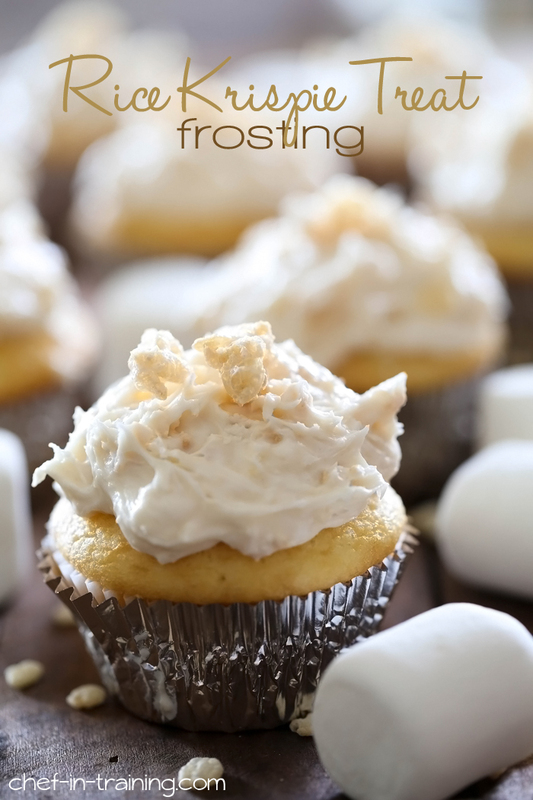 Top your cupcakes with this delicious frosting recipe! 5 Rice Krispie Treats, unwrapped from package and broken/crushed into little pieces. I used store bought Rice Krispie Treats, but you can also make your own. Add marshmallow creme, vanilla, milk and powdered sugar and beat until smooth. Add more milk and/or powdered sugar to reach desired consistency. Add crushed Rice Krispie Treats and beat gently into frosting. This is AWESOME! Rice Krispie Treats in a marshmallowy frosting sounds like the best frosting ever. Yum! I've tried the cookie dough Oreos and they weren't as good as I had anticipated. I should've bought the marshmallow krispie ones too. I'll have to go back to the store! Loving this frosting. I just saw those cookies at the store today!!! I love this frosting! Thanks for the link love! This frosting is seriously to die for. I gave my batch to my office and they gobbled it up right away! My kids will love your forever for this recipe! We are making it today on their day off of school... and it was SO fun to meet you at BYBC - you are gorgeous! umm these look delicious! Cupckaes are some of my favorite things, and so are rice krispy treats, so why not put the two of them together?! You're so smart :) Thanks for the great recipe. I have no words. This looks SO amazing! WOW....this is genius!! Rice Krispy treats are my all time favorite go to snacks. I make them often. This is so scrumptious looking I just want to put my face right smack dab in the middle of that cupcake...a must try for me real soon! This is one of the most amazing things I have ever seen!! Absolutely genius!! Mmm this looks phenomenal. I'm with Averie, I just want to eat that frosting by the spoonful. Yum!